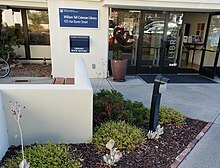 ^ "The Middlebury Institute of International Studies at Monterey (formerly Monterey Institute of International Studies) — Graduate School of Language and Educational Linguistics". Peacecorps.gov. Americorps.gov. Retrieved 2 February 2016. ^ "William Potter (Dr)". www.nato-pa.int. NATO Parliamentary Assembly. 29 May 2011. ^ "Jose Aybar". www.ccc.edu. City Colleges of Chicago. ^ "H.E. Ambassador Werner Matías Romero Ambassador of El Salvador to the UK". www.latamforumedinburgh.com. Edinburgh Latin American Forum. ^ "Interview with Samuel A. Worthington". live.worldbank.org. The World Bank. This page was last edited on 29 March 2019, at 18:24 (UTC).